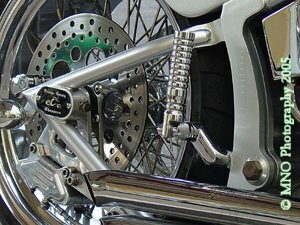 Two hundred color photographs reveal the history of custom motorcycles and the amazing bikes produced by Orange County Choppers. On the second Friday of Bike Week March 11th. 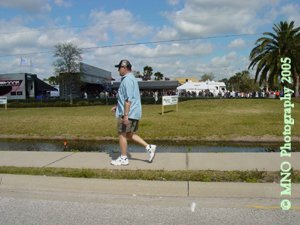 we thought we would drop by and get a few pictures of Paul Teutul Sr., Paulie and Mikey of Orange County Choppers and stars of The Discovery Channel's American Chopper series. But, as you can see the lines went back several blocks and we had a tight schedule. 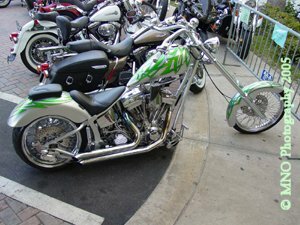 However, the OCC chopper pictured above was found outside a Daytona Beach hotel on the ocean. 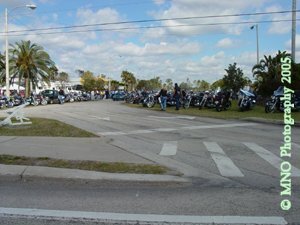 You never know where the Daytona Bike Week camera will be. 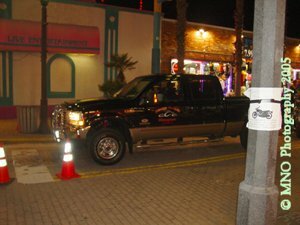 As chance would have it, while taking pictures of the crowds, custom motorcycles and choppers on Main Street I caught a few of the OCC crew cruising in the company truck! Much like the new OCC Trucks designed by American Specialty Trucks. Huge Selection of Merchandise ranging from Orange County Choppers, Choppers Inc, Wiley X Sunglasses with fast delivery on all orders.